If you have not heard of Bluehole, you will have heard of their 2017 battle royale sensation, PlayerUnknown’s Battlegrounds. It is fair to say that Bluehole subsidiary PUBG Corp. have dominated the burgeoning battle royale genre – now Bluehole want similar success with the MMORPG. Enter Ascent: Infinite Realm, an MMO with a steampunk twist. Related: train yourself to be the king of battle royale with our PlayerUnknown’s Battlegrounds guide. 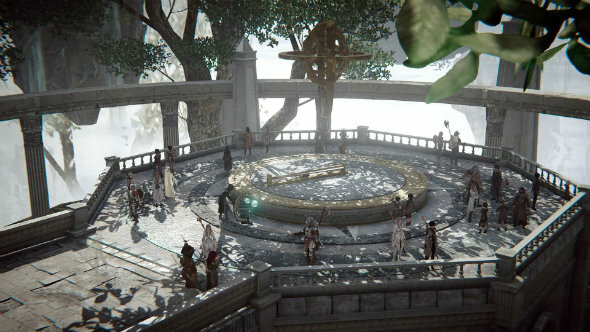 Ascent: Infinite Realm will be published by Kakao Games, a South Korean company that also published Black Desert Online – so they have some experience handling the demands of a massively multiplayer RPG. The small taste of Ascent: Infinite Realm we have had so far reveals plenty of detail already: we will be fighting inter-realm battles with giant mechs that unleash themselves from even bigger airships, while also building impressive bases and fishing in tranquil lakes. We could do with some respite from the ever-present, existential dread of Bluehole’s other barnstorming hit, so here is everything we know about Ascent: Infinite Realm. When is the Ascent: Infinite Realm release date? We don’t know yet, but hopefully we can get our hands on the complete version of Ascent: Infinite Realm by late 2018. For all the latest on the Ascent: Infinite Realm release date, keep checking back here. In better news, an Ascent: Infinite Realm beta is slated in English in 2018, with a Korean beta scheduled for December 2017. Fingers crossed the frame rate drops and performance issues present in the gameplay trailer have been ironed out. We can’t complain too much, though: the game is currently in early alpha. We know that the Ascent: Infinite Realm gameplay will not be too grind-heavy: players have 30 levels, and it should take about 30 hours to reach the level cap. Like Destiny 2, getting to level 30 is just the beginning before we get to the proper endgame, realm vs realm PvP. We only really have the five-minute reveal trailer to go on for the moment, but it did give away plenty of suggestions as to how the Ascent: Infinite Realm gameplay will look and feel. And it looks absolutely manic. 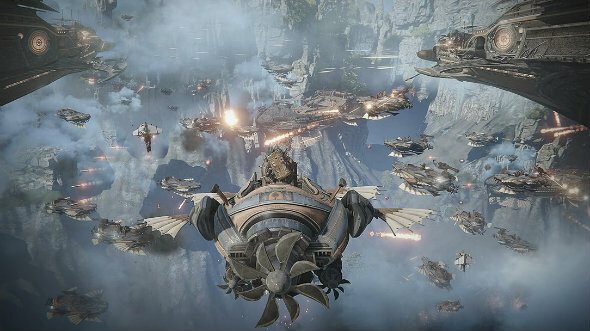 The trailer shows off airship combat, mech gameplay, fire-spewing dragons, dinosaurs, racing, fishing, base building, turrets, and loads more. From the peaceful therapy of fishing to stealthily stabbing a dragon in the back with the Assassin class, Ascent: Infinite Realm appears to have something for everyone. 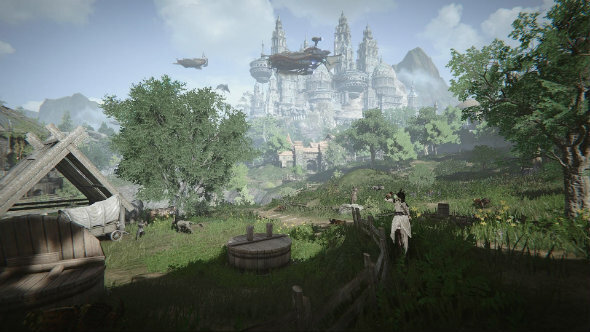 There will also be an open-world housing system in the game. We are looking forward to getting green fingers in our steampunk gardens and our own alien munchkins. 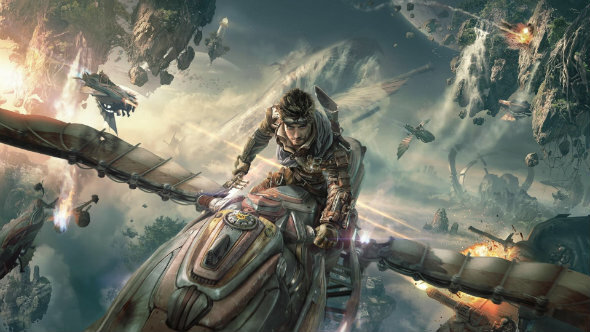 In a press release revealing the game, Bluehole say: “Vehicles and mounts in Ascent: Infinite realm serve more than just the purpose of transportation; they will also provide adventurers with the ultimate battle experience: Ascent: Infinite Realm’s Realm vs Realm PvP mode. 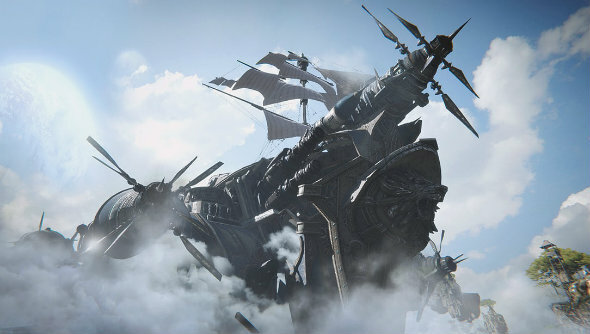 Clearly, in Ascent: Infinite Realm, bigger is better when it comes to its airships. Elaborate and decadent in all their steampunk glory, propellers valiantly spinning against the buffeting wind, the Ascent: Infinite Realm airships are gargantuan – we cannot wait to get our hands on the controls. 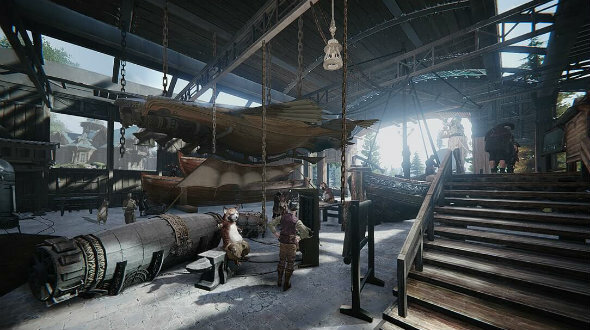 According to the reveal trailer, airships not only come in all different sizes, but will take on a variety of shapes, too. In it, we can see the biggest ships doing battle with enemy forces boarding in mid-air with explosions all around. 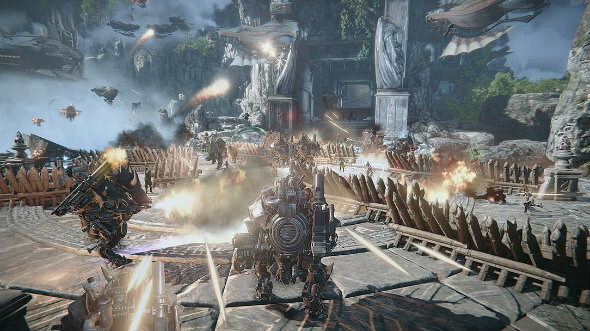 They also seem to function as a springboard for players to launch themselves into large mechs or gliders. Interestingly, we also know that you can adopt various tactics with the Ascent: Infinite Realm airships. For instance, you will be able to use clouds to conceal your airship and use your priviledged position to get the jump on your enemies. We are looking forward to seeing what other tactics we can take advantage of in the game. The Ascent: Infinite Realm PvP aspect centres on persistent battles between realms – hence the game’s name. The press release gives us an indication of the variety we can expect from the Ascent: Infinite Realm PvP mode. It sounds like absolute chaos, especially the 40-player Arena mode. 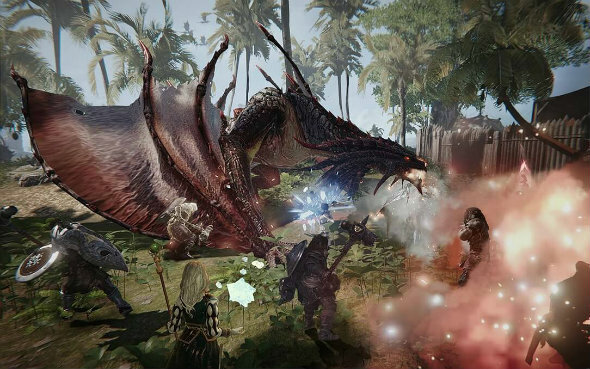 Here, two teams of 20 players fight it out both airborne and on foot, attacking and defending various objectives. The Sorceress boasts a strong elemental magic ability, but is lacking in durability. Do not be fooled by the Mystic’s child-like appearance: the Mystic uses potent powers of nature to heal allies and deal damage to foes from a distance. The Warlord is your typical tank. As this Ascent: Infinite Realm class, you will be getting stuck in on the front line with your battle prowess and high defense capabilities. Again, you will get the gist of this class if you are an MMORPG fan: high damage, attack speed, and critical hit chance are offset by a small attack range and health bar. The Gunslinger is shaping up to be the flair class. Make the difference in battle with ridiculous shots or a volley of powerful blasts. We do not know very much about customisation in Ascent: Infinite Realm yet, but we are looking forward to hopefully decking our airships and other vehicles out in our own style when the game comes out. The character classes already look especially detailed, but we are hoping that does not mean we will not be able to give them our own look. Our first look at this intriguing MMORPG shows the intricately designed airships we will soon be piloting in the steampunk skies of Ascent: Infinite Realm. There is everything we know about Ascent: Infinite Realm. Let us know what you think of the game in the comments below.